Posted on Mon, Nov 21, 2011 : 7:54 p.m.
LAHAINA, Hawaii — Monday's opening-round Maui Invitational matchup between Michigan and Memphis couldn't have featured two more contrasting styles. Memphis is up-tempo, wanting to run in virtually any situation. Michigan is more subdued, relying on stout defense and sharp shooting to get the job done. The Wolverines hung with the Tigers at their own game early, but in the end, slow and steady definitely won the race. "We got sloppy offensively, we started rushing some things and we didn't want the score to be 100-90," Michigan senior guard Zack Novak said. "We slowed down, got good shots, switched to the zone and the biggest thing we did was rebound." Jordan Morgan (52) puts up a jump shot while Memphis' Chris Crawford (3) and Tarik Black (10) look on Monday in Lahaina, Hawaii. Michigan defeated Memphis, 73-61. Having confounded Memphis earlier in the half with a brief look at the 1-3-1 zone, Michigan began switching between man-to-man and an aggressive 2-3 zone toward the end of the first half. The result was several one-shot possessions for Memphis and a 10-0 run to close the half for Michigan, giving the Wolverines a six-point lead they'd never surrender. "We're not a big zone team," said Memphis coach Josh Pastner, whose team went 19-for-57 from the floor. "(Michigan is) very good at what they do. "We practiced it for the last 72 hours. ... If you're making shots, you probably are going to get out of the zone. We didn't make shots." The Tigers didn't only not make buckets. They didn't rebound, either. Entering the game, Michigan had been out-rebounded 96-93 during three games against Ferris State, Towson and Western Illinois. Against the highly-athletic Tigers, though, the Wolverines owned the glass. Michigan held a 38-29 rebounding edge on the game. Thirty-two of those rebounds were on the defensive glass, negating any chance of Memphis putbacks. "We just made hits, we got guys blocked out," Novak said. "Rebounding just comes down to effort a lot of times. We really knew they were going to fly at the glass, that's how they scored a lot of points in the tape we saw. "We figured if we could keep them off the glass and not give them second chances, then our chances to win were going to go way up." Tasked with playing three games in three days, Michigan coach John Beilein expected to expand his rotation to keep players fresh throughout the week. Beilein was true to his word, and his bench didn't disappoint. Michigan played 11 players Monday and got extended minutes from seldom-used players like Colton Christian, Blake McLimans and Eso Akunne. Christian dropped in a bucket, drew a charge and grabbed a rebound in his four minutes. McLimans pulled down a rebound and played effective zone defense in his seven minutes. Akunne's deep 3-pointer midway through the second half gave the Wolverines their largest lead of the game and sent the entire maize and blue sideline into the biggest frenzy its been in all season. "We're going to be here for three days, win or lose. I wanted to make sure we gave a little bit more rest than we were giving," Beilein said. "And we stopped and embraced the moment when Eso hit that shot. "Rather than go right in the huddle, I told the assistant coaches, 'Let's just think about what happened. That young man has worked so hard, and now on a national stage he makes that shot.' Then we went back in the huddle and you could see the team's reaction (also)." Michigan developed a reputation as a 3-point-happy basketball team a season ago, and appeared to live up to it during the first three games of the 2011-12 season. On Monday, though, Michigan proved it didn't need a long-distance barrage to beat a good basketball team. The Wolverines went just 6-for-20 from 3-point range, but finished 21-for-30 from inside the arc -- a 70-percent shooting clip. "You look at a lot of the big wins we've had in the past and we really shot the lights out," Novak said. "Today, we shot well, but it wasn't a 3-point barrage or anything. We've got players that worked really hard to expand their game so that we're more than just a 3-point shooting team. "You can see it already this season, we haven't shot the ball particularly well (from the outside), but we're still winning. That's only going to help us down the road." 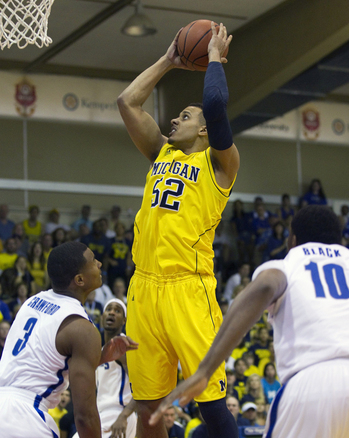 Jon Horford shows off Michigan's special Maui Invitational shoes and socks on this dunk. The Michigan basketball team wore special sky-blue Maui Invitational warmup shooting shirts and new sky-blue Adidas socks and shoes. The team's blue shooting shirts included a Hawaiian-themed logo Ku, the Hawaiian god of war. The gear is exclusively designed by Adidas for this year's Maui event and will be worn by Michigan, Kansas, Tennessee, UCLA and Chaminade. For the first time this season, Michigan found itself in foul trouble. Sophomore forward Jordan Morgan played just 11 minutes after picking up two fouls early. Forward Evan Smotrycz finished with four fouls and Novak fouled out. ... The Lahaina Civic Center features a large wall sign honoring all former champions and tournament most valuable players. Michigan won the tournament in 1988 and Glen Rice was the event's MVP. The only problem is, the sign features the wrong spelling of Rice's first name, listing him as "Glenn." Tue, Nov 22, 2011 : 3:02 p.m.
2nd standout performance by the Maize N Blue in the past 48 hours. It's amazing to watch THIS offense move the ball and get everyone involved. Two seasons ago you could pretty much guarantee they couldn't score unless Harris or Sims touched the ball. Now everyone is getting touches on each possesion and they're getting open looks for 3 pts and backdoor cuts for lay-ups. Kudos to Beilein and his staff for coaching these kids and getting them ready to play. Go Blue. Revenge on the Dookies! Tue, Nov 22, 2011 : 3:58 a.m.
Can't believe im post #1 .. That was a solid game on both ends of the floor for Michigan,and a coaching clinic put on by J.B. , he put 2 zone defenses that frustrated Memphis run &amp; gun game plan,and Trey Burke is very talented true freshmen,made a few freshmen mistakes,but overall should be able to fill in the vacated point position. Beilein never scolded him,just encouraged and coach em up. Good article Nick ! I read your piece,then watched the game on the dvr,you were spot on.. They showed the winnest teams in the history of the Maui Classic,and of course NC and Duke were on tops with 13 &amp;12 games won,but Michigan was 7th with a 9-3 record... not bad for that football school up north.. GO BLUE..